Zapped! Hopemax is Outta This World with Zaps! Discussion in 'Pin Zaps & Swaps' started by chubs191, Feb 9, 2019. She got me too! I have to admit that this post is a week and two days late. I've been occupied with KH3 and I got a bad cold BUT look at all these really fantastic goodies! There's nothing like Japanese Kit Kat's! There were three included: an apple (ringo) flavor, a strawberry cheesecake (sutoroberi chizukeki), and a third I can't remember but it was soooo good. 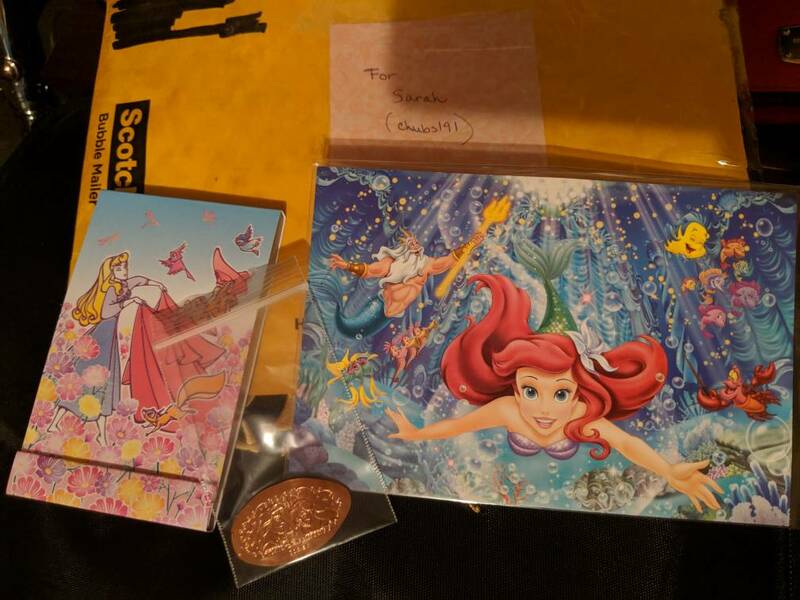 I decided to turn my beautiful pressed penny into a pin, so it can rest with my other prized Ariel possessions! Thank you so much again, Hope! Booger1964, coblj003, watzshakinbacon and 2 others like this. Beautiful postcard and pressed penny! The notepad is cute, too! Congrats on the zap! @hopemax is on a roll! so generous for thinking of so many of us! Very nice! Congrats and I hope you're feeling better! Shelterkat A Very Merry Unbirthday!